The HearStrong Foundation is raising $10,000 for two amazing sisters who are helping kids with hearing loss. 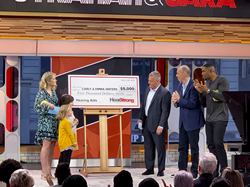 HearStrong Founder, Ed Keller, and Former NFL Quarterback, Jim Kelly, appeared on GMA Strahan & Sara to donate to the sisters’ efforts. I want to help people hear better and I want people to be happy and proud of their ears. I want to let people know all about hearing aids and how they are awesome!